Pest Expert Formula 'C+' Carpet Beetle Spray kills carpet beetles fast and leaves a residue that offers long-lasting carpet beetle control. This ready-to-use insecticide is safe for direct application to carpets, rugs, soft furnishings and clothing storage areas. 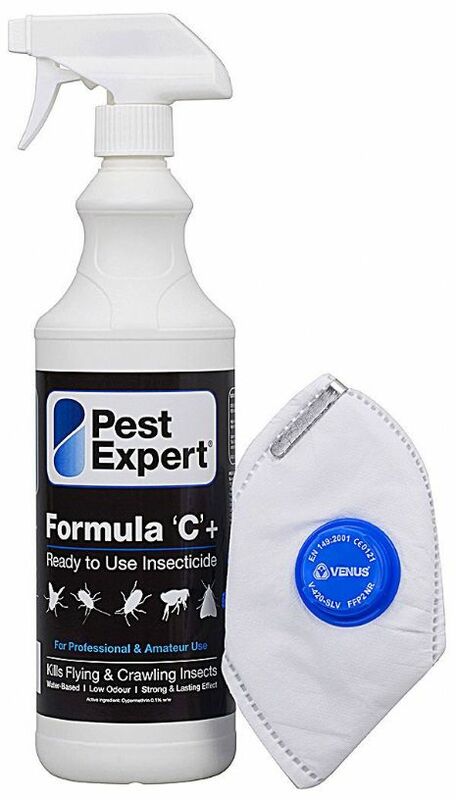 A one litre trigger spray covers 20 sq m.
Pest Expert Formula 'C+' Carpet Beetle Spray contains cypermethrin (0.1% w/w), which kills carpet beetles fast and leaves a long-lasting residue that maintains carpet beetle control for up to 12 weeks. Formula 'C+' is a ready-to-use insecticide that is safe for direct application to carpets, rugs, soft furnishings and clothing storage areas. As Formula 'C+' is water-based and low odour, it is ideal for treating carpet beetle infestations in domestic or commercial situations. For a comprehensive carpet beetle treatment, we recommend using alongside Pest Expert Formula 'P' Carpet Beetle Powder and Formula P Fogger as the combination of different active ingredients enables a faster and more effective knockdown. Alternatively see our full range of products for the best carpet beetle killer products on the market. Brilliant. I had a pretty serious carpet beetle infestation, in part due to the cats stashing raw food and also due to a lot of animal products being stored (feathers etc). Excellent product does exactly what is says on the tin. great service thank you. Excellent product, easy to use and works well. killed everything I sprayed with it. would use again and recommend this product. Tackling carpet beetles. The discovery of an infestation of carpet beetles came as a shock. Treating the with Formula C Carpet Beetle Killer has been effective. To date there MAY be one or two still lurking from this recent invasion but their days are numbered. I have given weekly treatment so that any reproductive cycle is broken. I will continue with intermittent treatment until there is no trace of the 'invaders' for at least a month or so when I can be sure all is well. This product does what it says on the tin. Brilliant, has eradicated them from the house. Many thanks, great product, would recommend it to anyone with a similar problem. Spray away. Good product, kills the beetles dead...I didnt know we had silver fish but this product has killed all them too. Have placed two orders now with Pest Control Supplies and can only praise the professional and excellent service given. Its a pity more Companies cannot provide such an efficient delivery service.Time will tell on the quality of items received. Excellent Service. I ordered this product recently and was extremely impressed with the speed of delivery, and tracking service. I am about to put the product to the test and if it is as good as the Company's service I shall be delighted. I had the carpet taken up in the worst infected area, and sprayed Perbio on the back, as I was told it might stain the wool carpet. The spray quickly filtered through, and after a week there is no sign of stain, or beetle. Does what it says on the tin. The spray was very effective and seems to keep the crawlies away for a couple of weeks after spraying. If spraying directly on to the pesky creatures its not an instant knock down, takes a few mins to kill them. Good Product he do the job,No mess or deposit found after use, except dead beetles. Arrived very quickly. Appears to be working. Pest Expert Formula ‘P’ Carpet Beetle Powder is a powerful permethrin dust which kills carpet beetle eggs and larvae as well as adult carpet beetles. Supplied in an easy-to-use puffer pack to enable precise application to carpets, rugs, soft furnishings, clothing storage areas and other cracks and crevices which may be harbouring carpet beetles. Pest Expert Formula 'C+' Carpet Beetle Spray kills carpet beetles fast and leaves a residue that offers long-lasting carpet beetle control. This ready-to-use insecticide is safe for direct application to carpets, rugs, soft furnishings and clothing storage areas. A 5L container covers 100 sq m.
The Pest Expert Formula 'P+' Fogger is a total-release aerosol device for fumigating carpet beetle infestations. The Fogger releases an insecticidal gas which penetrates into cracks and crevices to kill carpet beetles harbouring there. Use 1-2 Foggers for treating an average size room. The strongest amateur approved Carpet Beetle killer spray on the market. Lasts for up to 12 weeks after being applied.